I've been exploring various Splash page, or About Me, sites over the last week or so, and one of my favorites so far is flavors.me. I read about this program in Mashable, and was inspired to give it a try. I was impressed with how user-friendly this program is, and its highly customized features. I created this page on the screenshot you see here in about 20 minutes on my iPad, and plan to tweak and embellish on my computer, as I need the upload functionality for that. I also still need to add my bio, which doesn't appear to work on the iPad. 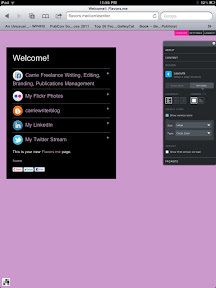 The free version of this program offers plenty for those just wanting a test run, including 4 social media profile links, some dynamic template designs, as well as layout and type size selection. One of the standout features is that when users click on your social media profiles, they get a pop up of your live stream, and not just the profile link. The premium version is $20 a year, and includes features I think are well worth it, such as a Contact form, nearly 20 profile links, real-time stats, and more custom design features. Premium users also get included in the Directory listing, and while this seems like a good idea, I don't know the page views on this, so it remains to be seen. I also don't know the SEO of this site versus other competitors, such as About.Me, although I noted that a metadata optimized SEO feature is included in the premium version. If you consider that the premium version could almost replace a full website, the price is fair, and the usability is straightforward. I briefly tried out About.me as well, and while I liked the interface, I was surprised it did not allow users to type custom titles for an added URL. In other words, the program defaults to the web page title, which may not be the content you want to focus on. Has anyone else explored various About Me sites? Please leave a comment or a link to your favorites! Thanks Abbie, glad you liked it.